Photography is fascinating, isn’t it? Because while it’s true that the camera doesn’t lie, it’s also true that, depending where I point my lens, I can include (or exclude) key elements of my visual field to tell a certain story. Careful composition is fundamental to good photography. So, too, by choosing certain photographs (and not others) to share, a person can present themselves in such a way as to tell a carefully curated story of who they are. Not necessarily to be deceptive, but in the human way that each of us wants to put our best foot forward. Recently, I found myself doing just that. 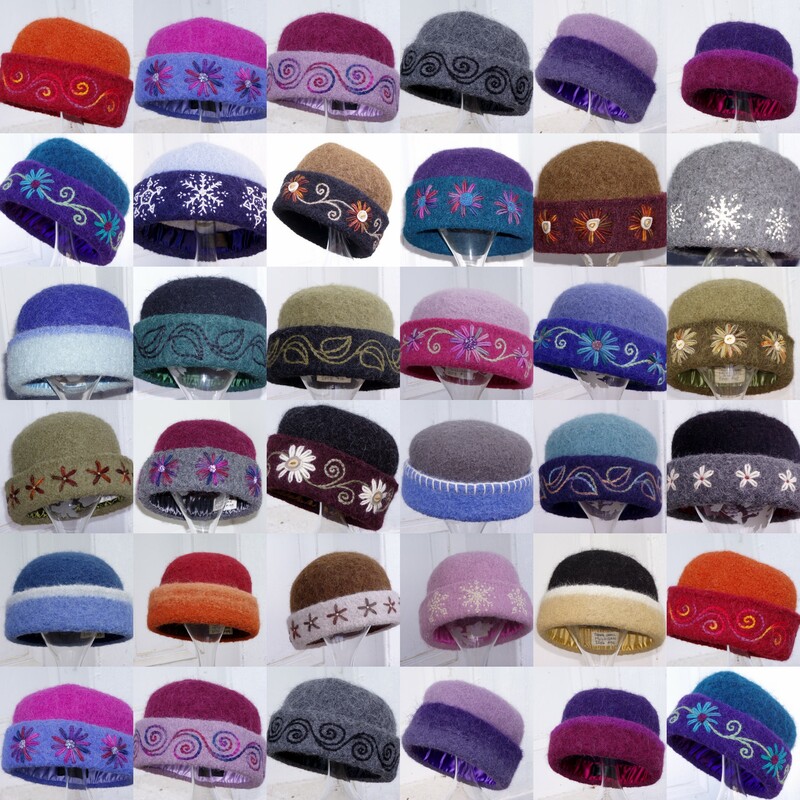 I’d been very productive shrinking and shaping a greater number of hats than usual and wanted to share the most recent crop with friends, fans & followers. 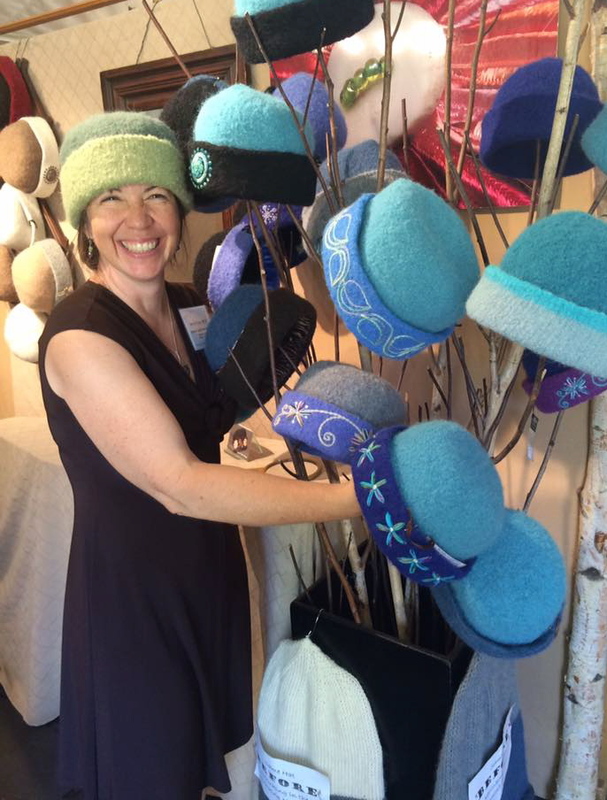 A VERY carefully framed photo of my studio showcases my hats… And nothing else! Cheerful, fun & tidy, right? I agree. I love this view. I feel energized and inspired to start embroidering just gazing at the neat, colorful rows of woolly goodness! Uhh, yeah. That’s for real, people. Oof. I’m not proud. Behold the stacks of years’ worth of random files, receipts, inventory lists, and who knows what else! I certainly didn’t, despite hauling the piles to & from my closet multiple times to hide the mess when visitors came. Live with clutter like this long enough and eventually your brain tunes it out. But, ignoring clutter comes at a cost. It drains energy and zaps creativity. It alters my studio from the fiber playground I love into a place I start to avoid…. And that’s no good! And so, struck by a powerful bout of Spring Fever and inspired by the ideas of Gretchen Rubin, Alyson B. Stanfield, & Marie Kondo, I scheduled a single 30 minute block a few weekends ago to just begin. Just get started. I set a timer and set my mind to do as much decluttering as possible in a half hour. Make it a game. Keep expectations low. Without internal pressure to complete the whole task perfectly, I set to work. When the chimes sounded, I was just getting going, so I worked another 30 minutes, feeling energized. Isn’t it gorgeous? Not only do I love to see the textured slate surface of my desktop, but now I’ve got that physical space back to actually work on projects. Most importantly, though, I’ve freed up precious mental space to dream up new designs, and have increased energy to execute them! So much winning! Behold! My (currently) clutter-free fiber studio in Canaan, NH. Do you struggle with reducing clutter? Or maybe you have tips on how you keep your clutter at bay? Either way, I’d love to hear all about it, so please leave a comment below or connect on Twitter, Facebook, Instagram or Pinterest.